In any case, Pegg’s latest, Hector and the Search for Happiness, directed by Peter Chesolm, is something of a departure. As the title might suggest, Pegg plays a man searching for inner peace. Hector is a psychiatrist who, having lost the ability to offer insight to his own patients embarks on a quest to figure out the formula for happiness. The journey that takes him from Africa to Shanghai to Tibet. If not, who knows. The director has had more luck with television than his theatrical endeavors, which include Hannah Montana: The Movie, Shall We Dance, Serendipity and the almost universally reviled Town & Country, so I’m not sure what to expect from him. The screenplay, based on the novel “Le voyage d’Hector ou la recherche de bonheur” by Françoise Lelord, has three credited writers including the director, Maria von Heland, and Tinker Lindsay. But, as I said, on the strength of Pegg , not to mention the supporting cast, which includes Toni Collette, Rosamund Pike (who last appeared with Pegg in 2013’s The World’s End), Stellan Skarsgård, Jean Reno, and Christopher Plummer, I’m keeping an open mind. Hector and the Search For Happiness, which was released in the UK last month, opens in the US on September 19. Simon Pegg stars in Relativity Media’s HECTOR AND THE SEARCH FOR HAPPINESS. Simon Pegg stars as Hector in Relativity Media’s HECTOR AND THE SEARCH FOR HAPPINESS. Professor Coreman (Christopher Plummer) and Agnes (Toni Collette) in Relativity Media’s HECTOR AND THE SEARCH FOR HAPPINESS. Rosamund Pike and Simon Pegg star in Relativity Medias’s HECTOR AND THE SEARCH FOR HAPPINESS. Simon Pegg and Ming Zhao star in Relativity Media’s HECTOR AND THE SEARCH FOR HAPPINESS. 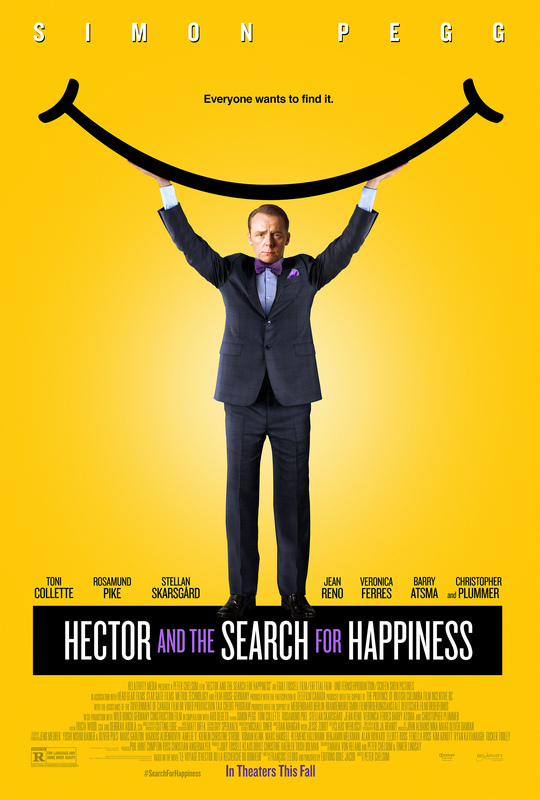 Stellan Skarsgård and Simon Pegg star in Relativity Media’s HECTOR AND THE SEARCH FOR HAPPINESS. Veronica Ferres and Simon Pegg star in Relativity Media’s HECTOR AND THE SEARCH FOR HAPPINESS. (right) Stellan Skarsgård, and (left) Simon Pegg star in Relativity Media’s HECTOR AND THE SEARCH FOR HAPPINESS. (left) Jean Reno and (right) Simon Pegg star in Relativity Media’s HECTOR AND THE SEARCH FOR HAPPINESS. Simon Pegg stars in Relativity MediasÕ HECTOR AND THE SEARCH FOR HAPPINESS. Director-PETER CHELSOM with star Simon Pegg on the set of Relativity MediasÕ HECTOR AND THE SEARCH FOR HAPPINESS. (right) Stellan Skarsgård and (left) Simon Pegg star in Relativity Media’s HECTOR AND THE SEARCH FOR HAPPINESS. ROSAMUND PIKE stars in Relativity Media’s HECTOR AND THE SEARCH FOR HAPPINESS. ROSAMUND PIKE stars in Relativity Medias’s HECTOR AND THE SEARCH FOR HAPPINESS. This entry was posted in film clips, Film Festivals, movie news, movie posters, movie trailers, movies, Musings, Posters, S. A. Young, stills, Trailers and tagged Christopher Plummer, Hector and the Search for Happiness, movie trailer, nick frost, photos, Rosamund Pike, S. A. Young author, simon pegg, Stellan Skarsgard, tiff, Toni Collette, toronto international film festival, video. Bookmark the permalink.